Prevention is a key component of your overall dental health. At Green Tree Dental, Dr. Schmidt and our team provide general dental care that includes complete preventive care. We do all we can to help you avoid problems with your smile in the future. As part of our commitment to providing complete family dentistry, we offer an array of general dental treatments to our patients. Routine Exams & Cleanings – We recommend you come in approximately every six months for an exam and cleaning. This allows us to check for any signs of decay or other issues. 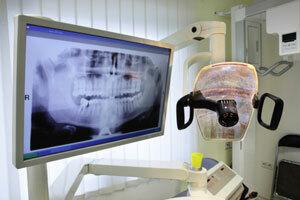 Digital X-rays – We use X-rays to detect decay and issues with the roots of teeth or the jawbone. If we notice any issues, we can begin planning your treatment right away. Sealants – Dental sealants cover chewing surfaces, particularly the molars, and keep food particles from sticking there and causing bacteria to grow. We often place sealants on children’s teeth, but they can be helpful at any age. Fluoride Treatments – Regular fluoride treatments help strengthen enamel and fight off plaque build-up, so we recommend them for adults and children. I brush regularly. Do I really need to come in every six months? In short, yes! We’re glad to hear that you brush your teeth the recommended twice a day for at least two minutes each time, but brushing can’t clean all the places that we can. Not even flossing can remove the plaque and tartar that our tools can. Plus, we’re able to take a close look at your teeth and gums during your exam and check for signs of oral cancer, which is very curable if caught early. The best thing to do is schedule your next appointment with us when you’re checking out! My gums bleed when I floss. Does that mean I should stop flossing? Absolutely not; in fact, floss more frequently! Your gums are bleeding because of some level of gingivitis. The best way to counteract that is to floss more to remove more of the bacteria. As you remove it, your gums will bleed less and be less irritated. You should also let us know at your next appointment, so we can make sure there isn’t a more serious underlying issue. There are so many toothbrushes and toothpastes to choose from. Help me choose! While the flavor of toothpaste is up to you, we recommend making sure it has 0.24% fluoride to help keep the enamel strong. Your goal for your teeth (whitening, countering sensitivity, etc.) will also help you decide which is best for you. As for the toothbrush, make sure you get one with soft bristles that isn’t too big for your mouth. Getting a brush that’s the right size for you is important for making sure that you reach all tooth surfaces while you’re brushing.